Lorenzo F. Pace, University of Molise; Atlantic Council, Washington D.C. In an article of mine on the OMT case of early 2016 I had anticipated that: «Against the generalized criticism of the preliminary reference of the BVerfG, and also of the convincing Gauweiler judgment, the German Court is unlikely to confirm the final judgment in its assessment of the unconstitutionality of the OMT, leaving it then space only for the formulation of general disapproving criticism» (Pace). The German Court issued on 21 June 2016 a judgment that decides, after the 2015 Gauweiler judgment of the Court of Justice, the “OMT case”. In this judgment the BVerfG, in contrast to what was telegraphed in its 2014 preliminary reference, confirmed the legality of the OMT program. In the reasoning of the judgment, the BVerfG criticizes some aspects of the Gauweiler judgment and sets out some additional implementing conditions to the OMT program. These are not provided for in the Gauweiler judgment but are implicitly contained in the 2012 ECB decision. The BVerfG in its judgment decided the various pleas of constitutionality proposed before it in October 2012. As is well known, the OMT program is the crisis management tool for an effective protection exercise of monetary policy adopted by the ECB in 2012 in one of the more virulent periods of the Eurozone crisis (on the OMT see D’Acunto in this Blog). Basically, the OMT case represents an attempt by the BVerfG to “impose” changes to the OMT requirements, with subsequent effects for all Member States of the Eurozone. The BVerfG claimed that, in the absence of these modifications, the BVerfG would have declared the OMT unconstitutional. The Court of Justice however confirmed in the Gauweiler judgment the legality of the OMT program as formulated by the ECB in 2012. From the point of view of the Court’s judgment, the BVerfG’s attempt to influence the content of the OMT program therefore failed. With the present post, I would like firstly to put the BVerfG judgment into the context of a drawn-out conflict between the German Republic and the European Union regarding the setting up of the crisis management tool in the area of monetary policy, the SMP program in 2010 and the OMT program in 2012. Secondly, I would like to show the contrary of what the BVerfG claims in its judgment, namely that the Court of Justice accepted in its judgment the “requests” of the German Court issued in its preliminary reference. In fact, the BVerfG, in order to demonstrate that the Court of Justice complied with the questions formulated in the preliminary reference relies on principles not contained in that judgment (see for instance, the alleged ECB obligation to limit ex ante the volume of purchases under the OMT program – see infra, para. 7). It appears more reasonable to read the German Court’s conclusions on the legality of the OMT program as an attempt to avoid a confrontation with the Court of Justice that could have resulted in a significant institutional crisis. Such a crisis would have been comparable, as I wrote in the earlier article, to the 1832 US nullification crisis started following the enactment of the 1828 Tariff Act (Pace, para. 6). The BVerfG conclusion has probably been influenced by the well-reasoned Gauweiler case as well as by widespread criticism of it in legal scholarship vis-à-vis the preliminary reference to the Court of Justice (however see, inter alia, the positive attitude vis-à-vis the BVerfG reference by the Kronberger Kreis). I propose to focus the present post only on the operative part of the BVerfG judgment; that is, the final 46 paragraphs of the 220 paragraphs of the judgment (specifically, paras. 174-220). As noted in my analysis of the OMT preliminary ruling, in that case there was a significant difference (if not contradiction) between the “theoretical” and the “operative” part of the preliminary reference. The Eurozone financial crisis is the consequence of the choice of Member States, at the time of the creation of Economic and Monetary Union, not to establish institutions to tackle EMU economic and monetary crises. The absence of such institutions was justified in the following terms by the former member of the ECB Executive Board, Jürgen Stark: «There were no bailouts or rescue facilities because they weren’t ever supposed to be necessary» (as reported by Zhong). In other words, prior to the crisis, owing to a problem of unsatisfactory regulation by the Member States (based nevertheless on a clear political choice), there were no institutional tools to counter systemic crises relating to Member States’ public debt or to address the impact of a crisis on the ECB’s monetary policy. The cause of the onset of the Eurozone crisis in October 2009, as now agreed by many and recently acknowledged by the President of the Bundesbank, Jens Weidmann (para. 3.2), was the 2003 decision of France and Germany to breach the Stability Pact without being sanctioned (on this point, see Pace,p. 2162). The de facto suspension of the Stability and Growth Pact, along with the severe limitations of the European statistical system for the correctness of the budgetary data provided by the Member States – already denounced by the European Court of Auditors in 2000 – created the situation which then led to the start of the financial crisis in 2009. The mismanagement of the Irish crisis through the Franco-German Deauville Pact of October 2010 as well as the mismanagement of the second Greek crisis created a contagion effect that spread to Portugal, Spain and Italy. As I have tried to outline elsewhere (Pace, para. 2), the Eurozone crisis was solved by the creation of crisis management institutions as the crisis unfolded, that is: the European Stability Mechanism (ESM) for the management of crises related basically to Member States’ debt and the Outright Monetary Transactions (OMT) for the management of monetary policy crises. Moreover, the modification of the Stability and Growth Pact (SGP) was set out through the so-called “six-pack” and “two-pack” as well as the Fiscal Compact. Finally, the Banking Union was devised with the goal of stopping the “perverse relationship” between Member States’ debt and banking sector crises. It is not my goal to make value judgments about how the German Republic chose to direct and control for its part the development and solution of the Eurozone crisis. Instead, I aim to identify the dynamics that led to the development of the crisis in order to perform a correct legal analysis. It is beyond doubt that, in the definition of the crisis management institutions, the German Republic insisted that the most important aspects of these institutions had to be drafted in intergovernmental agreements so as to prevent their being modified by a majority vote according to the Community method. The decision to enact measures with acts outside the confines of EU law allowed for the well-known Eurozone crisis “intergovernmental drift”. The permanent 2012 ESM bail-out fund was in fact established through an intergovernmental agreement after the amendment of Article 136 TFEU. The temporary 2010 European Financial Stability Facility (EFSF) bail-out fund was also established outside the framework of EU law. The EFSF was established in the form of a private company under Luxembourg law whose shareholders were the Eurozone Member States and it was incorporated on June 7 at the office of notary Jacques Delvaux. Even the main principles of the Stability and Growth Pact set out in the six pack (including the so-called “golden rule” of balancing the budget) were inserted into the Fiscal Compact (Treaty on Stability, Coordination and Governance in the Economic and Monetary Union, 2 March 2012), an intergovernmental agreement. In the Banking Union, certain aspects of the bank restructuring fund are set out in an intergovernmental agreement. Discussions at the European level are now focused on the creation of the European deposit insurance system (the so-called Banking Union “third leg”) through another intergovernmental agreement (Romano). The OMT program is the only crisis management tool that was approved, as an ECB decision, by a simple majority (Art. 10.2 ESCB Statute). In other words, no Member State could unilaterally impose its veto at the time of its adoption. By the same token, no part of the OMT decision was “crystallized” in an intergovernmental agreement. The “OMT case” must be understood in light of the dynamic of this “intergovernmental drift”. In particular, it should be understood taking account of the Member States’ desire (notably Germany’s) unilaterally to limit the Union’s recourse to crisis management measures that elude the Community method. Indeed, the “OMT case” is basically the means by which the BVerfG attempted to “impose” stricter program requirements on the OMT. By contrast, the Court of Justice in the 2015 Gauweiler judgment confirmed the legality of the OMT program as defined by the ECB in 2012. The OMT (like the previous version of the program, the SMP) is an open market operation program (Art. 18 ESCB Statute) aimed at guaranteeing the effective exercise of monetary policy by the ECB in a crisis scenario. The ECB argued, even before the start of the Eurozone crisis, that excessive spreads in the interest rates of government bonds of different Eurozone Members would effectively eliminate the possibility of the ECB to exercise its monetary policy using ordinary “levers”, first of all, through the setting of money interest rates (Trichet, p. 11). Excessive spreads would thus undermine the singleness of the ECB monetary policy as defined in the Treaties, and the correct transfer of ECB monetary policy impulses. The OMT, not unlike the SMP program, allowed intervention in exceptional situations when interest rates of Eurozone States’ bonds became irrationally high as a consequence of market conditions. Through bond purchases, and according to the principle of supply and demand, the OMT would bring these rates to a rational level. In this sense, the OMT does not transform the ECB into a “lender of last resort”, as erroneously feared by the BVerfG (Preliminary reference, para. 94). The ECB’s objective is not the stability of the Eurozone but the protection of the effective exercise of its monetary policy (this is actually recognized by the BVerfG itself in its judgment of 21 June 2016 – see BVerfG judgment, para. 3.c). The OMT’s important indirect effect is that, by not allowing interest rates on government bonds of States in financial stress to reach levels that make their debt unsustainable, Eurozone States are prevented from defaulting on their debt, thereby making the Euro irreversible. Given the exceptional nature of this program, the OMT decision, unlike the SPM program, sets out strict criteria and conditions for its activation and exercise. These programs, both the SMP and the OMT, have been criticized by the German Republic, and specifically by both the Bundesbank and the BVerfG. The first wave of the Bundesbank’s criticism was formulated as the ECB rolled out its first bond purchase program, i.e. the 2010 SMP program. These criticisms were based on financial reasons. The program was widely criticized by the Bundesbank’s President at that time, Axel Weber, and by one of the ECB’s Executive Board members, Germany’s Jürgen Stark. In particular, President Weber complained that the injection of liquidity into the market would create “substantial stability risks” (as reported by David Crawford Brian Blackstone). Furthermore, it was feared that this decision would favor an uncontrolled increase in inflation (As reported by Fairless, Italy vs. Germany, WSJ Europe, 1 August 2012). Over time, these fears proved unfounded. What is relevant here is that both of them, lacking the possibility to veto the SMP program (as unanimity in the Council pursuant to Art. 10.2 ESCB Statute was not provided for), resigned from their posts in 2011. A second wave of criticism concerning the unlawfulness of the SMP program was made by the next Bundesbank President, Jens Weidmann. There were two reasons that pushed the Bundesbank to continue to oppose the SPM bond-buying program. In the words of President Weidmann, there was a risk that the ECB would “overstep its mandate”; furthermore, the program was «tantamount to financing Governments by printing bank notes» (as reported by Blackstone – Boston, Draghi Defends Bond Program in Germany, in the WSJ Europe, 25 October 2012). In other words, the Bundesbank stopped criticizing the ECB’s (SMP) bond-buying program from an economic/financial point of view (issues that after two years had proved to be unfounded) and started to raise criticisms about the program on a point of law – a peculiar perspective for an entity like the Bundesbank. However, these two legality issues, while evident in the SMP program, were later specifically addressed and resolved in the drafting of the OMT program. The Bundesbank’s third area of criticism was raised against the new ECB program for the protection of the effective exercise of the ECB’s monetary policy, i.e. the OMT (on the ECB’s role in the crisis, see Cafaro). In fact, Jens Weidmann, as Bundesbank President, was the only member of the ECB Governing Council who on 2 August 2012 voted against the decision on the mere possibility of establishing a new bond-buying program (Draghi). Paradoxically, the OMT was then the ECB’s response to the criticism directed by President Weidmann against the SMP program. In response to the complaint of illegality, the ECB Governing Council (made up of members of the Executive Committee and the Presidents of each of the Eurozone’s national central banks) approved on 6 September 2012 the strict OMT activation and exercise requirements. The OMT formally replaced the SMP. It is no coincidence that each of the OMT requirements was aimed at avoiding the illegality issues outlined by the Bundesbank President, i.e. : the illegality of such a program for the breach of the ECB mandate and for the breach of Art. 123 TFEU. These OMT activation and exercise requirements were later assessed by the Court of Justice in its Gauweiler judgment and were deemed to be fully in line with EU law. The fourth order of criticism of the German Republic against the OMT was formulated by the BVerfG in its 2014 preliminary reference. One can see a clear trait d’union between the German Bundesbank and the German Constitutional Court in continuing the same objections regarding the legality of the OMT program. Like the Bundesbank, the BVerfG – as a result of the appeals brought before it in October 2012 – considered that the OMT program was in breach of the ECB mandate and that it violated the prohibition contained in Art. 123 TFEU. The BVerfG also added, when referring the case to the Court of Justice, a new issue related to Germany’s “constitutional identity” (Preliminary reference, para. 27). In this respect, one of the BVerfG’s concerns, ultimately, is the inability of the Bundestag to exercise its powers of control over the federal budget as provided by the Federal Constitution, powers which are, in the BVerfG’s view, part of the German constitutional identity (Preliminary reference, para. 28). The BVerfG concludes, in its sui generis referral, that the OMT is a breach of both European Union law and German Constitutional Law. In particular, the Court threatens the disapplication of the OMT program by all German agencies, federal and state (Preliminary reference, para. 30), in the absence of a corrective interpretation of the Court of Justice (Preliminary reference, para. 99). This conclusion of the BVerfG has been labeled as an «(offensive) invitation to the ECJ to restrict the implication of the OMT program by means of interpretation» (Wendel, p. 277). The Court of Justice responded to the preliminary reference of the BVerfG with the Gauweiler judgment. This judgment was rightly called a «model of restraint» (see the editorial, On Courts of Last Resort). The Court in its judgment did not in fact seek confrontation with the BVerfG – confrontation that was already created with the previous Mangold/Honeywell judgment. Rather, it sought to show the legality of the OMT «on the force of its substantive arguments» (Claes – Reestman, p. 946). The only point disputed by the Court (Gauweiler, para. 16) related to the supposed lack of binding nature of the judgment of the Court (Preliminary reference, para. 27). With reference to the OMT, the Court recognized the legality of the program by clarifying that the requirements as defined there constituted a solid system of checks and balances in order to ensure that the bond-buying program was in breach of neither the mandate of the ECB nor Art. 123 TFEU. However, the Court did not follow the BVerfG’s “request” to impose new restrictions on the activation and exercise of the OMT program. To the contrary, the Court affirmed the legality of the program as drafted by the ECB in 2012 without any reservation. Moreover, the Court in para. 88 of the judgment clearly rejected the BVerfG’s “request” that the volume of bond purchases in the OMT program should be limited ex ante (BVerfG reference para. 101). This aspect was of particular importance with regard to the subsequent judgment of the BVerfG (see infra, para. 6). In spite of the numerous and different profiles of illegality raised within the German Republic starting from 2010, the German Constitutional Court has recognized in its OMT judgment the legality of the OMT program pursuant to both Union and German constitutional law. It makes some critical remarks on the Gauweiler judgment, criticisms that do not limit the future effectiveness of the OMT program if (and when) the program will be triggered. The BVerfG’s judgment can be summarized, following the English-language synopsis published by the BVerfG itself, as follows. a) Regarding the first part of the ultra vires review, the BVerfG concludes that the OMT program does not breach the ECB mandate. The program is in fact «to the largest extent monetary in kind» (para. 3.c). In order to reach this conclusion, the Court had to elaborate a difficult analysis aimed at showing that the Court of Justice had in fact accepted the views of the BVerfG as expressed in the preliminary reference. The difficulty stems from the fact that the Court of Justice, as mentioned above, considered the OMT decision as adopted in 2012 to be lawful, without taking the BVerfG’s views into consideration. It is no coincidence that the German Court criticizes the content of the Gauweiler judgment, arguing that the judgment «meets with serious objections on the part of the Senate» with reference to different aspects: «these objections concern the way the facts of the case were established, the way the principle of conferral was discussed, and the way the judicial review of acts of the European Central Bank that relate to the definition of its mandate was conducted» (para. 3.a). In spite of this, the German Court finds that the OMT program is lawful, arguing that it does not «manifestly exceed the competence attributed» to the ECB (para. 3.c). This is all the more peculiar in that the BVerfG had already rejected that conclusion on the «manifest nature of the breach» in the preliminary reference (Preliminary reference, paras. 56, 84, 95, 99). This apparent contradiction is justified, according to the BVerfG, by the fact that the Court of Justice «has essentially performed the restrictive interpretation of the policy decision that the Senate’s request for a preliminary ruling of 14 January 2014 held to be possible» (para. 3.c). To this end, the BVerfG distinguishes between «the decision of 6 September», on the one hand, and «the implementation of the programme» on the other. The distinction is clearly aimed at the (expected) goal of the German Court: that is, to single out a (restrictive) interpretation of the OMT program’s requirements. According to the German Court, the Court of Justice «bases its review not only on the policy decision of 6 September 2012 concerning the technical details, but derives further framework conditions – in particular from the principle of proportionality –, which set binding limits for any implementation of the OMT programme» (para. 3.a.). Moreover, «in using procedural means to limit the ECB’s competences by reviewing whether the principle of proportionality has been observed, the Court of Justice takes up the issue of the nearly unlimited potential of the decision of 6 September 2012» (para. 3.c). The BVerfG concludes that: «The restrictive parameters developed by the Court of Justice do not completely remove the character of the OMT programme insofar as it encroaches upon economic policy. However, together with the conditions prescribed by the decision of 6 September 2012 […] they make it appear acceptable to assume that the character of the OMT programme is at least to the largest extent monetary in kind» (para. 3.c). b) Continuing with its ultra vires review, the BVerfG also finds that the OMT is not in breach of Art. 123 TFEU. As the BVerfG states: «if interpreted in accordance with the Court of Justice’s judgment, the policy decision on the technical framework conditions of the OMT programme as well as its possible implementation […] do not manifestly violate the prohibition of monetary financing of the budget» (para. 3.d). The German Court is here faced with an even harder problem, which is to bring its own demands in the preliminary reference into line with the Gauweiler judgment. This is because the Court of Justice clearly refused in the Gauweiler judgment to amend the requirements of the OMT decision, as “requested” by the BVerfG, in particular regarding the “request” to impose ex ante limits to bond purchases by the ECB (Gauweiler, para. 88). The German Court appears to contradict what it had stated just before in relation to the OMT program’s lawfulness. According to the BVerfG, «although the Court of Justice considers the policy decision to be permissible even without further specifications, its implementation must fulfill further conditions in order for the purchase programme to not violate Union law». Moreover, «since, against this backdrop, the OMT programme constitutes an ultra vires act if the framework conditions defined by the Court of Justice are not met, the German Bundesbank may only participate in the programme’s implementation if and to the extent that the prerequisites defined by the Court of Justice are met». It then lists these conditions, namely that: «purchases are not announced // the volume of the purchases is limited from the outset // there is a minimum period between the issue of the government bonds and their purchase by the ESCB that is defined from the outset and prevents the issuing conditions from being distorted // the ESCB purchases only government bonds of Member States that have bond market access enabling the funding of such bonds // purchased bonds are only in exceptional cases held until maturity and // purchases are restricted or ceased and purchased bonds are remarketed should continuing the intervention become unnecessary». Astonishingly, one of those conditions is an ex ante limitation of the volume of bond purchases by the ECB (see infra, para. 7). Finally, even with reference to the lawfulness of Art. 123 TFEU, the German Court seems to assert that the Court of Justice positively reacted to the BVerfG’s “request” for a restrictive interpretation of the OMT requirements. Reading the Gauweiler judgment provides a different impression. c) With reference to the alleged breach of the German constitutional identity, the BVerfG excludes that the OMT program as interpreted by the Court of Justice «presents a constitutionally relevant threat to the Bundestag’s right to decide on the budget» (para. 3.f). This conclusion of the BVerfG probably follows the inclusion of the requisites of the ex ante limitation of the volume of bond purchases by the ECB in an OMT program. The BVerfG concludes by outlining an obligation on the Federal Government and the Bundestag in the context of Integrationverantwortung. According to the BVerfG, not only is it necessary to control that the conditions defined in the BVerfG judgment are met, these bodies should also check the existence of a specific danger for the federal budget that may arise, in particular, from the volume of bonds purchased pursuant to the OMT and the risk structure of the purchased bonds, «which may change even after their purchase» (para. 3.g). The BVerfG in its judgment continues to maintain a position which cannot be shared and which I believe to be incorrect from the point of view of EU law. The BVerfG had unjustifiably expressed the view, in its preliminary reference, that under OMT «the Eurosystem would in any case be available as a “lender of last resort” for the government bonds in question» (Preliminary reference, para. 94 – see my criticisms on this, para. 4.a). Also objectionable is the BVerfG’s statement in its final judgment that the OMT program before the Gauweiler judgment had an «almost unlimited potential» («Das Problem des nahezu unbegrenzten Potentials des Beschlusses vom 6. September 2012»; BVerfG judgment, para. 196). As already claimed, it was possible to state that the SMP program could have had an «almost unlimited potential», and for this reason I have claimed that it was probably in breach of EU law (see Pace, para. 4.a; Ruffert limits the illegality of the SMP to the concrete bond purchases of August 2011, see Ruffert, The EMU in the ECJ – A new dimension of dispute resolution in the process of European integration, in Daniele (ed. ), The Democratic Principle and the Economic and Monetary Union, 2016, forthcoming). This is certainly not the case with regard to the OMT. The requirements of that program were aimed precisely at restricting this «almost unlimited potential». The ECB, in the activation and exercise of the bond purchase program, had to follow these strict conditions. These were specifically defined in order to dispel the doubts of legality regarding the breach of the ECB mandate and of Art. 123 TFEU as claimed in 2012 by President Weidmann of the Bundesbank (see supra, para. 4). Moreover, I disagree with the idea put forward by the BVerfG that the Court of Justice actually accepted the views of the BVerfG as expressed in its preliminary reference. I propose to challenge the BVerfG’s assumption by focusing on the alleged requirement spelled out in the Gauweiler judgment regarding the ex ante limitation of the volume of purchases of the OMT program that would have modified the OMT decision (BVerfG judgment, para. 195). As already underlined, with its request for a preliminary ruling by the Court of Justice, the German Court had tried to secure, in addition to the conditions relating to the exercise of the OMT program, the additional condition that the «government bonds of selected Member States [must not be] purchased up to unlimited amounts» (Preliminary reference, para. 101). The BVerfG claims in its final judgment that: «The German Bundesbank is entitled only to participate in a future implementation of the OMT program if and when the prerequisites laid down by the Court of the European Union are met, i.e. if […] the volume of the purchases is limited from the outset». As portrayed by the BVerfG, it would appear that the ECJ opted for a narrow reading of the OMT program as “requested” by the BVerfG. However, a closer reading shows that this is not the case, and that indeed the opposite is true. In fact, in the grounds of the judgment the BVerfG argues that the Court of Justice inserted a requirement to limit ex ante the bond purchases in these terms: «Unlike the parameters resulting from the basic decision of 6 September 2012, […] the Court of Justice denies an unlimited extension of the purchase program. The volume of future purchases must be specified and binding in advance and must not exceed what is necessary to restore the transmission mechanism. The decision to actually carry out bond purchases, and the pre-determined volume of the planned acquisitions may not be announced (ECJ Gauweiler, para. 106)» (BVerfG judgment, para. 195). The BVerfG recalls para. 106 of the Gauweiler judgment. The content of para. 106 should illustrate that the German Court does not dispute the fact that the OMT program does not provide ex ante purchase limits (The OMT program sets forth that «No ex ante quantitative limits on the size of Outright Monetary Transactions [are permitted]»). The limitation of this part of the OMT decision was in fact the clear objective of the “request” made at para. 101 of the preliminary reference. If the German Court had wished to contest this criterion in the final judgment it would have recalled and criticized para. 88 of the Gauweiler judgment which, in clear opposition to para. 101 of the BVerfG’s preliminary reference, supports the lawfulness of such a clause in these terms: «In those circumstances, a programme […] could legitimately be adopted by the ESCB without a quantitative limit being set prior to its implementation» (Gauweiler, para. 88). The Court of Justice also indicates why it would not be possible to limit ex ante that volume, explaining that «such a limit being likely […] to reduce the programme’s effectiveness» (Gauweiler, para. 88). The text of para. 106 of Gauweiler, which is recalled by the BVerfG in para. 195 of its judgment, allows one to understand what the German Court is referring to. Paragraph 106 reads: «The ECB has also made clear before the Court that the ESCB intends […] to refrain from making any prior announcement concerning either its decision to carry out such purchases or the volume of purchases envisaged». In other words, since the BVerfG disputes neither the relevant passage of the OMT decision nor para. 88 of the Gauweiler judgment, the German Court in para. 195 of its judgment maintains something very different from what is held in para. 101 of the reference to the Court of Justice. It merely claims that the (future and possible) execution of the OMT program will provide ex ante the volume of bond purchases (without this being announced) set with the goal of restoring monetary policy transmission. This reading does not exclude (but rather recognizes) that if the volume of purchases decided ex ante by the ECB does not reach the predefined ECB goal (that is, a certain level of interest requested for bonds of Member States in financial stress), the European Central Bank could further extend the volume of bond purchases. What the BVerfG holds in its judgment does not provide anything new and does not constitute, as the BVerfG claims, a limitation of the content of the OMT decision («Unlike the parameters resulting from the basic decision of 6 September 2012, […] the Court of Justice denies an unlimited extension of the purchase program»; BVerfG judgment para. 195). Indeed, what the BVerfG made clear is exactly what the OMT decision provides: i.e. a program quantitatively limited to the achievement of the restoration of the transmission mechanism (the OMT program sets forth that «The Governing Council will consider Outright Monetary Transactions […] and terminate them once their objectives are achieved […]»). This proves the correctness of the contention advanced in the introduction of this post, – namely that, contrary to what the BVerfG maintains in its judgment, the Court of Justice in its Gauweiler judgment did not accept the requests made by the German Court in its preliminary reference. Indeed, the reverse is true: the BVerfG has accepted the conclusions of the Gauweiler judgment. In this sense, the way in which the BVerfG justifies its conclusion has the goal not only of avoiding «the humiliation of recognizing the position taken in its referral as erroneous» (Goldmann, p. 9). It has the goal of dissimulating its – failed – attempt to modify the content of the OMT program through the interpretation requested in the preliminary reference to the Court of Justice. The OMT case cannot be reduced to the mere issue of Union law interpretation between the Court of Justice and the BVerfG. As I showed, the OMT case was an attempt by the BVerfG to derogate from the Community method and its majority vote system vis-à-vis the OMT program through a different way of design Eurozone crisis measures. This had already happened through German pressure with the ESM, with some aspects of the SGP and of the Banking Union (see supra, para. 3). In the OMT case in 2014, the BVerfG with its preliminary reference sought to influence the way in which the OMT program operates. It is not by chance that the OMT case brought to a higher level through the BVerfG after the Bundesbank could not veto the SMP in 2010 or the OMT in 2012 (see supra, para. 4). This attempt by the BVerfG was rejected by the Court of Justice in its 2015 Gauweiler judgment (see supra, para. 6). It upheld the lawfulness of the OMT program as formulated by the ECB in 2012. The BVerfG asserts in the final judgment that the Court of Justice «has essentially performed the restrictive interpretation of the policy decision that the Senate’s request for a preliminary ruling of 14 January 2014 held to be possible» (para. 3.c). The BVerfG thus admits that the Court of Justice did not follow the requests of the German Court. The only way for the BVerfG not to trigger an institutional crisis by declaring the OMT in breach of Union law was to follow Goldmann’s suggestion (p. 9), i.e., to revert to the principle that: «Finding an act to be ultra vires requires […] that it manifestly exceed the competences transferred to the European Union» (BVerfG judgment, para. 3.c). By following this principle the BVerfG is able to claim that «if interpreted in accordance with the Court of Justice’s judgment, the policy decision on the OMT programme does not […] ‘manifestly’ [exceed] the competences attributed to the European Central Bank» (BVerfG judgment, para. 3.c). By contrast, in Gauweiler there is no proof that the Court of Justice adopted a restrictive interpretation of the program. There is not even proof, as demonstrated by the “phantom requirement” (supra, para. 7), that the Court of Justice derogated from the written parameters of the OMT program – contrary to the claims of the BVerfG («Unlike the parameters resulting from the basic decision of 6 September 2012, […] the Court of Justice denies an unlimited extension of the purchase program», BVerfG judgment, para. 195). As already stated, the Court of Justice upheld the legality of the OMT program as drafted in 2012, with no exceptions. From this point of view, the BVerfG might have relied more wisely on the «manifestly exceed the competence» principle before deciding to ask the ECJ for a preliminary ruling. But the German Court wanted the Court of Justice to limit the principle of an “open ended” OMT program (Preliminary reference, para. 101). In its view, this principle could have threatened the Bundestag’s power to control the federal budget (Preliminary reference, para. 28). The Court of Justice in Gauweiler did not limit or derogate from the “open ended” requirement (Gauweiler, para. 88). The BVerfG claims in its judgment that this requirement was acceptable, which means that the “open ended” requirement was also acceptable before Gauweiler. The BVerfG in its judgment at least on this point proved itself to be wrong. As in the game of chicken, the BVerfG decided to drive the Court of Justice toward a collision course on this point, but the Court of Justice refused to turn and consequently the BVerfG in its judgment, not wanting to start an institutional crisis, had to swerve. The Court of Justice comes out of this “confrontation” with a stronger legitimation in its role. It seems to be no coincidence that the BVerfG subsequently preferred not to send a preliminary reference to the Court of Justice, even in cases where it should have, and to decide the case by itself. The stronger legitimation of the Court of Justice in its role also emerges from another aspect, i.e. the fact that the BVerfG, notwithstanding its “self-proclaimed” independence from the binding nature of the judgments of the Court of Justice (Preliminary reference, para. 27) had to bring its judgment into line with the Gauweiler judgment. Moreover, the fact that the BVerfG judgment confirming the legality of the OMT was published two days before the Brexit referendum shows one more thing. The German Court itself recognizes the essential importance of the OMT program for the stability of the Eurozone in crisis situations or in the midst of market turbulence, stability that is also clearly in the interest of Germany. In my view, the OMT case was a final showdown regarding the extent to which the Community method could be “bent” in order to reassure major Eurozone Member States in the design of crisis management institutions. As in every showdown there are, in a broad sense, winners and losers. Among the winners one could list the ECB. The OMT case shows that it exercised its monetary competence in a lawful manner, without misusing its independence. From this point of view it seems peculiar that the Bundesbank President is again criticizing an alleged potential misuse of ECB independence in the Quantitative Easing (QE) program (Fubini;. on the QE see D’Acunto in this Blog). This is odd also because recent criticisms regarding the independence of the ECB are often coming from the State where Ordoliberalism was founded and together with it the quest, inter alia, for a fully independent Central Bank (Allen). In the OMT case, one should not forget that the ECB had to enact such a program since neither the Member States nor the EU institutions, which would have been more properly competent parties to enact a measure of this kind, had enacted them (See also De Grauwe, p. 524). Instead, they preferred to leave that role to the ECB, thereby endangering its independence and legitimacy, and turning the ECB into a “lightning rod” for criticism – as the BVerfG reference shows – of actions that should have been carried out by other entities. Also among the “winners” one could list all the Institutions and legal principles that were at stake in the OMT case: the Court of Justice and its role as a centralized body of binding interpretation of EU law as well as the principle of independence of the EU Legal system (see supra, para. 5). As is well known, this principle is protected inter alia by the independent interpretation of Union law by the Court of Justice. An important role in the “positive” conclusion of the OMT case was played by European legal scholarship. The decision of the BVerfG not to “cross the Rubicon” and not to start an institutional crisis with the Union was also driven by the coherent and intense criticisms raised in that scholarship against the BVerfG’s preliminary reference (for a list of the abundant legal scholarship that discussed, inter alia, the BVerfG’s preliminary reference, see Pace and the special issue of The Maastricht Journal of European & Comparative Constitutional Law, edited by Fabbrini). Among the losers of this showdown is the Bundesbank. Apart from the way in which the BVerfG framed its judgment in order to show that “it was right”, it is clear that the German Court too recognizes, pursuant to German Constitutional law, that the Bundesbank’s criticisms of the OMT that began in 2012 were inconsistent, and that the OMT program was fully legal. In the same category one could list also the BVerfG. The German Court with its preliminary reference threatened to create an institutional crisis of dimensions previously unknown in the Union that could have led the Union into uncharted waters. Such a crisis could have been comparable to the nullification crisis of the United States of America of 1832. It was probably advisable to review the legality of the OMT program. These kinds of open market operations are in fact subject to intense scrutiny and criticism on both sides of the Atlantic (I am referring, for instance, to the U.S. Federal Reserve’s Quantitative Easing). The way in which the BVerfG tried to have the legality of the OMT program reviewed was probably not the correct one. But again, the BVerfG’s goal was different. Its aim was to modify the content of the OMT program through the interpretation of the Court of Justice; in this, the BVerfG failed. The OMT case shows clearly, together with other aspects of the Economic and Monetary Union, an “intergovernmental drift” in the European integration process, i.e. the Member States’ quest to control the development of regulation in specific sectors and to ensure that these developments are not modified by a majority vote of Member States; this trend has been noted by, among others, Bundesbank President Weidmann, who has correctly referred to: «[t]he fear of giving up national sovereignty» (Weidmann, para. 4). 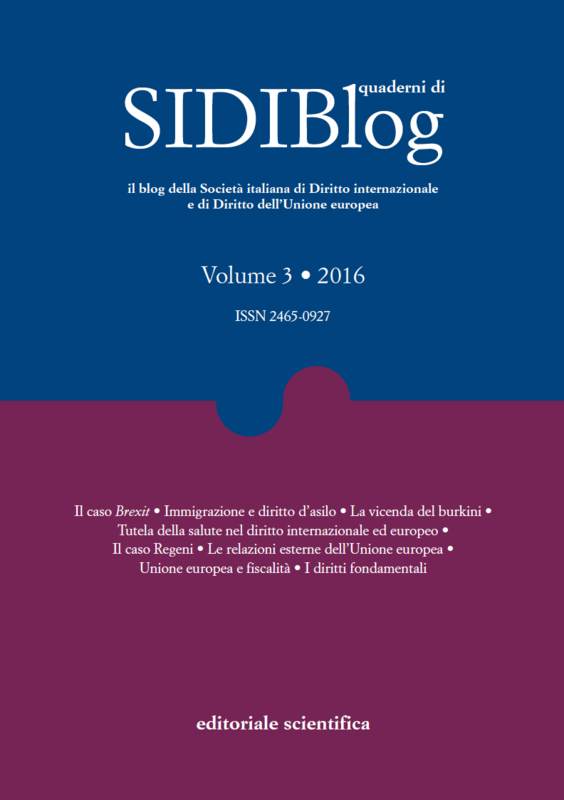 Consequently, «the strengthening of the existing framework remains the only alternative to make the Monetary Union more stable» (ibid., para. 4). It seems there is another way to reach this goal, as proposed for the third leg of the Banking Union (see supra, para. 3), namely, through another international agreement outside the sources of EU law. The OMT case is also relevant for understanding the legal nature of the European Union and its dynamics. It is interesting to note that in 2016 the result of the Brexit referendum shows the will of a Member State to abandon the Union. Yet in the same year a Constitutional Court of a Member State of enormous importance, Germany, stopped short of a judicial revolt, deciding instead to bring its judgment into line with that of the Court of Justice. La Corte di giustizia si pronuncia sul requisito della condivisione degli oneri relativi agli aiuti di Stato alle banche: una “legittimazione” del bail-in? De la crise française du burkini et du droit (international) : comment s’en sortir* (vraiment) ?